The Forged 735•CM™irons feature a blended design for the skilled player seeking the ideal combination of shot control, maneuverability and playability. Designed as a seamlessly blended set, Titleist Forged 735•CM irons have continuity in performance and aesthetics for a fluid transition from long to short irons. Progressive blade heights, blade lengths, offset, topline, center of gravity and moment of inertia allow each club to perform to Tour level standards, no matter what shot is required. Design: Progressive design offers continuity in performance and aesthetics for a fluid transition from long to short iron. From Anonymous of Atlanta, Georgia on 8/20/2007 . When you hit is solid, it's the longest iron in the game! 8/20/2007 – Which type of player are these irons best suited for? 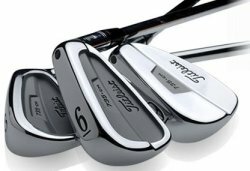 Response From FirstFairway: Titleist states that these irons are best suited for the skilled level player.